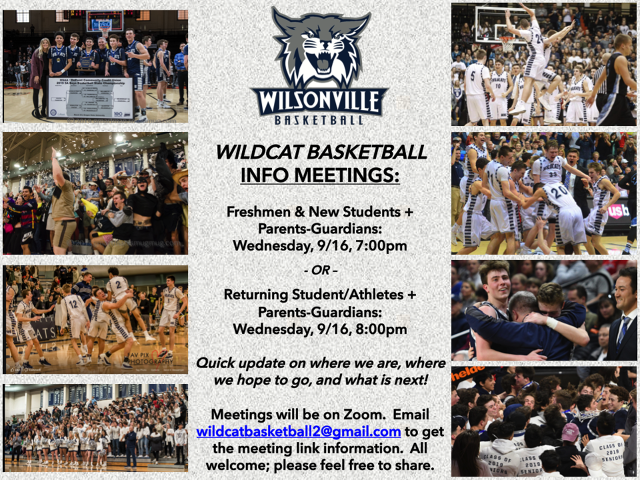 Welcome to the Home of the Wilsonville Wildcats! State Record 5 Straight State Championship Games ~ 2015-2016-2017-2018-2019! CORVALLIS — Jack Roche said Friday was about making history. Saturday was all about legacy. 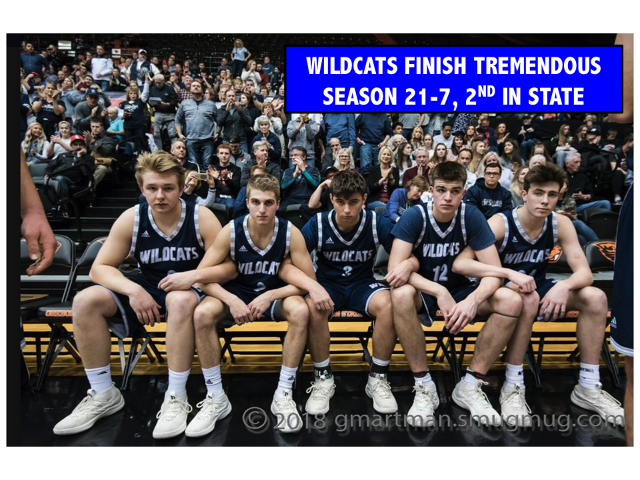 consecutive finals when it defeated Silverton in Friday’s semis, has won three titles during the span (2016-17, 2019). Wildcats coach Chris Roche also led Wilsonville (27-2) to a state championship in 2005. The program is 124-17 the past five seasons. 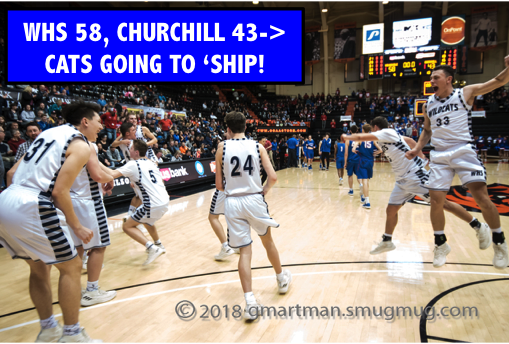 Churchill (23-5) trailed 31-26 at halftime and grabbed its first — and only — lead at 46-44 when Brian Goracke, Isaiah Wallace and Silas Bennion canned three-pointers on consecutive possessions to close the third quarter. The seasoned Wildcats opened the fourth with a 9-0 run, going up 43- 36 on Keegan Shivers' three-point play. Dakota Reber also had two baskets during the stretch. While Wilsonville’s offense hummed, the Lancers couldn’t get anything going. “I just felt like we were playing in hyper-speed,” Churchill coach Kelly Bokn said of his junior-led group. “We just couldn’t control our emotions; we just played so rushed offensively today. We battled back and got ourselves that lead, and we just didn’t take a deep breath and kind of settle in for good shots. An and-one by Goracke cut it to 58-53 with 1:59 remaining, but the Wildcats took care of business from the free throw line to close it out. One day after going 11 for 23 (47.8 percent) in its 50-45 semifinal win over Silverton, Wilsonville shot 21 of 26 (80.8 percent) from the line. “I wish I knew,” Jack Roche said on what changed overnight. Reber led the way with 21 points, nine rebounds and two steals. Fellow post Shivers had 12 points, 11 rebounds and two blocks. Sam Westing added 11 points off the bench, and Gabe Reichle (nine points), Jack Roche (seven) and Zachary Rivers (seven) rounded out Wilsonville’s scoring. Rivers, a senior guard, suffered an ankle injury in the second quarter and did not return. Struggling with his shooting touch for the third consecutive game, Roche instead focused on setting up his teammates. He played all 32 minutes Saturday and finished with 13 assists and two turnovers. Wallace had a strong game for Churchill, knocking down four three- pointers en route to a team-high 17 points. Sixth man Samaje Morgan added 13 points and four assists; Goracke tallied 10 points, four rebounds and two blocks. The Lancers got lost on defense early as Reber and Rivers hit open three-pointers for a 10-2 lead. Five consecutive points from Morgan — including a straight-away three — pulled Churchill within two, and the freshman guard then converted a coast-to-coast layup at the horn to make it 16-13 Wildcats after one quarter. Wallace tied the score at 26-26 on an elbow three, but Wilsonville netted the final five points of the half. 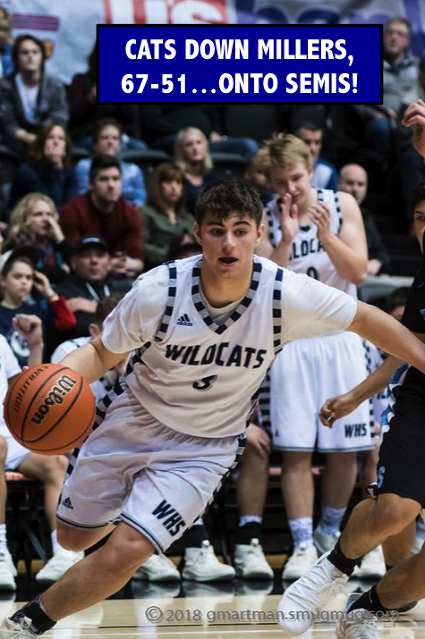 The Wildcats answered Churchill’s third-quarter run with a dominant fourth. Churchill is a four-time state runner-up under Bokn, including a loss to Wilsonville in the 2017 final. The Lancers, who are set to return every rotation piece next season, also placed second in 2013-14. WILSONVILLE (27-2): Dakota Reber 21; Keegan Shivers 12; Sam Westing 11; Gabe Reichle 9; Jack Roche 7; Zachary Rivers 7; Nolan Thebiay 0; Grant Irby 0. Totals 21-37 21-26 67. CHURCHILL (23-5): Isaiah Wallace 17; Samaje Morgan 13; Brian Goracke 10; Silas Bennion 9; Kaelan O'Neil 9; Dylan Carson 0; Evan Pia 0; Ejim Akuma III 0. Totals 21-56 9-12 58. Three-point goals--Wilsonville 4-9 (Sam Westing 2-2; Zachary Rivers 1-1; Dakota Reber 1-3; Jack Roche 0-3), Churchill 7-20 (Isaiah Wallace 4-6; Silas Bennion 1-3; Brian Goracke 1-4; Samaje Morgan 1- 3; Ejim Akuma III 0-1; Kaelan O'Neil 0-3). Fouled out--Wilsonville- None, Churchill-Ejim Akuma III; Kaelan O'Neil; Brian Goracke. Rebounds--Wilsonville 29 (Keegan Shivers 11), Churchill 26 (Kaelan O'Neil 6). Assists--Wilsonville 16 (Jack Roche 13), Churchill 8 (Samaje Morgan 4). Total fouls--Wilsonville 16, Churchill 22.